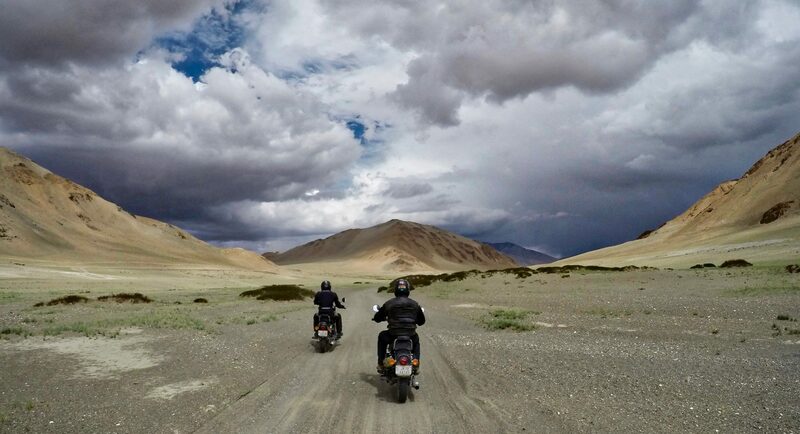 It’s been said that riding the Himalayas is the Jewel in the Crown for adventure motorcyclists. The combination of the world’s highest mountainscapes, the spiritual masterpieces of endless cliff-top monasteries, the earthy kindness of the Ladakhi people and some the most challenging – some might say brutish – terrain to be found anywhere on earth make this the expedition that serves as a benchmark to all others. But if Ladakh was to be my next adventure, the next question to answer was how to go about it. With 18 years of mainly solo adventure riding behind me, I decided to try something new this time: experience a new corner of the world on a bike as part of a – choking at the concept – tour group. My rationale was multifaceted – I had never ridden in Ladakh before and since half of the ground covered would be off road, having a guide and a support vehicle with mechanic through this extremely remote corner of the planet seemed a sensible decision. But another factor was that, although I love riding alone with all of the independent problem solving that brings with it, the idea of riding with a group of fellow adventurists appealed to me. Because of their India focus and the availability of a ride that fit my business trip schedule to Delhi, I chose Vintage Rides, a Paris-based group with offices in Delhi. The company maintains an extensive ride schedule that includes different geographies, levels of difficulty and luxury. The ride itself, labeled by the company “Oases and Peaks at World’s End”, covered 10 days of riding through Ladakh using Leh as its base. While the purpose of this report it not to review Vintage Rides, especially given that I have never used a tour company before against which to draw comparison, I could summarily say that there were hits and there were misses. At the most positive end of the spectrum, the capability of the group guide was exceptional. He engaged as a social facilitator, ensured the safely of the group to the best of his ability and became a good friend of each ride member. At the other end of the spectrum, the quality of the processes that got me to the point of mounting my Royal Enfield and heading off for the mountains were, at best, fragmented. In management consulting speak, a lack of ability to scale came to mind. The details of the ride itself will be posted to the ‘Rides’ section of this site, but addressing the question of solo versus group, I think the answer must reside with the individual. There is no denying the fact that the route we carved was a difficult one despite Vintage Rides rating is as ‘Intermediate’. Of the 1,200 km completed, at least 40% were on off-road conditions ranging from gravel, to rocks, to sand, to washboards, to dirt pack. Fording of streams was an integral, if not totally awesome part of the experience. The true level of difficultly was evidenced by the fact that eight low-speed spills occurred and mild if not painful injuries were the result of the terrain exceeding some riders’ expectations. The reason for conveying this fact is that riding solo on this route where the next human might be 10km away and mobile phone coverage is non-existent is a risky undertaking. Prepare as one may, I witnessed only a handful of riders undertaking the journey in solo mode. Given these facts, even as an experienced long distance rider I would tend to sway toward group mode or at bare minimum using a buddy system – scuba style – to ensure you always have someone at your back. Of the 38 countries I have ridden through, India’s Ladakh region, if done right, will challenge all but the most accomplished off road riders. And when considering that the bike you straddle will not be a KTM 690 Enduro, but rather a humble 500cc Royal Enfield Bullet, even hardened crossers may find themselves struggling on the rockiest trails. But what you get in return is beyond valuation: The austere beauty of one of the most remote and forbidding patches of the globe; from 18,000 foot passes to wide open and infinite deserts. Will you have to share your intimate experience of these superlatives of our natural world? Yes you will, but the 9 people riding along side you will keep you company along those endless and sometimes brutal days and, just maybe, you’ll make a few friends for life.